Katie Ledecky entered the world stage of swimming at the 2012 London Olympic Games by winning the 800 m freestyle in a time of 8:14.63, just short of Rebecca Adlington's world record. The quality of the original film used for this analysis was not good and so some finer points of the swimmer's technique are obscured. This stroke analysis includes a moving sequence in real time, a moving sequence where each frame is displayed for .5 of a second, and still frames. The time between each frame used in this analysis was .12 seconds. Frame #1: The right hand enters while the left arm pull is not half-way through its pulling path. The left arm bends at the elbow so that the forearm/hand approaches vertical. The power of the left arm pull is seen in the "milky water" that follows the forearm. It is the turbulent water that constitutes the drag pocket in front of the arm. Water pressure is reduced in the drag pocket causing the pressure differential between the front and rear of the arm to produce propulsion. The right foot kicks to counterbalance the initial force of the right arm. The left foot is poised to kick to counterbalance the vertical forces created by the entering right arm. The head is well down and the swimmer is streamlined. Frame #2: The right arm enters and stretches forward. The turbulence on top of the right arm indicates the amount and direction of the drag force created by stretching the arm forward underwater. The directions of the drag force components are vertical and horizontally backward. That results in a negative force that reduces forward momentum. The timing of the right arm entry renders this swimmer's stroke as being of the "catch-up" technique. The extended arm also limits the amount of shoulder roll. The left arm is in mid-pull and admirably vertical. The whole surface of the arm in this position generates propulsive force. To counterbalance the right arm entry, the left leg kicks. The swimmer is streamlined. Frame #3: The right arm continues to be extended. It has been feathered to reduce the amount of drag it creates. In that position, rotating the shoulders is difficult to achieve because the right shoulder no longer is part of the total rotation of both shoulders. However, to facilitate the left arm propulsion being as close as possible to the swimmer's centerline, the left foot kicks even deeper causing the left hip to rise, which is followed by some right shoulder rotation. This excessive kick is one of the compromises required in a catch-up stroking pattern. The kick position increases the active drag in the swimmer. The head is well down and the swimmer is streamlined. Frame #4: The left arm has completed its propulsion and is "rounding out", that being the initial stage of recovery. The left arm is still forward and the right leg remains deep. There is no propulsion in this period of the stroke. The various resistances act upon the swimmer and slow her. The deep left leg adds further to the overall resistance. Frame #5: The right arm has exited the water. The left arm presses down and shows some forearm rotation to better suit ensuing propulsive force production. The left leg has risen and the right leg begins to kick down to counterbalance the vertical force component created by the recovering left arm. The swimmer hyperextends the neck to look forward. Frame #6: The right arm begins to generate some horizontal force component. It still continues to create a substantial vertical force component. The speed of the arm's movement is increasing. From some time between Frames #3 and #4 to this Frame #6 no arm propulsion is evident (an inertial lag during which the swimmer slows). The left leg has recovered to the point of the ankle and foot being above the water surface (a useless position). The left arm has recovered well above the water. The right leg kicks deep to support that recovery position. The face remains oriented forward. Frame #7: The right-arm pull is effectively vertical. The elbow is bent at least 90 degrees which makes it both direct and powerful. The head is raised forward more than in previous frames. Frame #8: The directness of the right arm pull continues. The left arm enters and a small right leg kick occurs to counterbalance the vertical forces created at the entry. The face is now well forward and rising. Frame #9: The head is raised further and turned to breathe. The lifting of the head and shoulders disrupts streamline. The force to lift the front end of the swimmer is provided by the downward push of the left arm. There is a lull in the kicking action. The right arm begins to round-out. The length of the right arm propulsive phase is notable. Frame #10: The head and shoulders are still elevated and supported by the left-arm downward press. In above-water videos of this race, the rise and fall of the front end of the swimmer with the breathing action is quite noticeable. Streamline is disrupted. The kick-lull continues. Frame #11: The head is turning back into the water after inhalation. The left arm begins to flex at the elbow and the upper arm medially rotates. Forward propulsion is developing rapidly. In concert with the change of direction of force production of the left arm, the right leg kicks. Streamline is recovering. Frame #12: The head is fully down and the position in this frame is quite similar to that in Frame #1. The size of the kicking actions is excessive. The high left leg presents the back of the leg as added cross-sectional resistance although in this frame it has begun to kick down to counterbalance the almost entered right arm. The right leg has kicked deep to the extent that drag resistance is noticeable behind the foot. The toes pointing down further increases the resistance created by the leg. Frames #13 to #16: The positions and actions illustrated in Frames #1 through #4 are repeated. This view of Katie Ledecky's crawl stroke is more than 2.5 years old. It also illustrates the stage of an 800 m race where fatigue starts to impinge upon the technique of a swimmer. What is shown here should be compared to more recent videos. The main features that detract from the velocity of forward progression in this swimmer's stroke follow. The rise and fall of the head and upper body in the breathing action. That should be removed and replaced with only a head movement that rotates on the longitudinal axis to inhale in the bow wave. The disruption of streamline on every breath produces a negative resistive force that slows the swimmer. When that deceleration is multiplied by the number of breaths taken in an 800 m event, it is quite substantial. The catch-up stroke should be replaced with a balanced stroke. That would eliminate the inertial lags which over 800 m amount to a considerable amount of lost time, that is, time when propulsion could be developed. The kick should be much smaller. It is difficult to discern if the arm stroke actions are influenced by the large kick or if the arms influence the kick. However, the legs attain positions where they develop detrimental resistance, a further negative influence on progression. The legs never attain a position where they might create even a very small brief propulsive force. 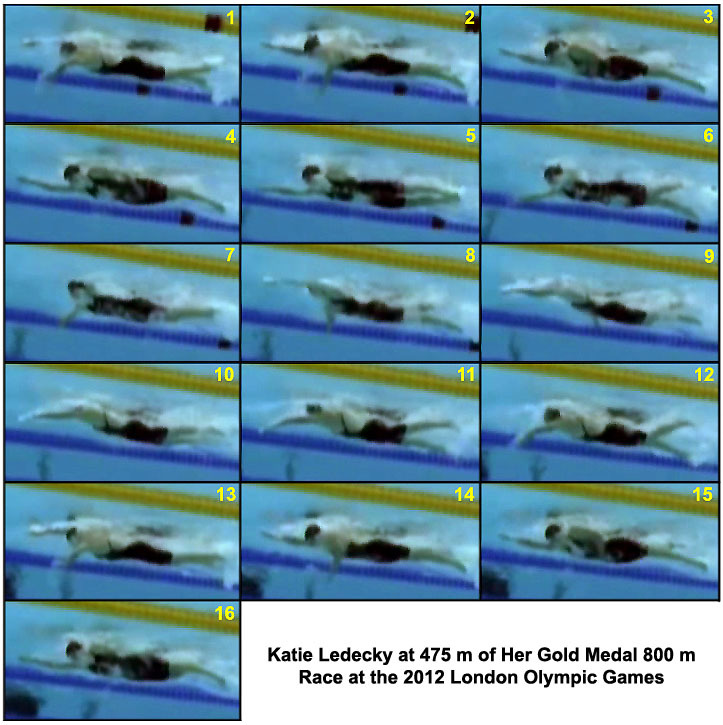 Unlike many female distance swimmers, Katie Ledecky used a 4-beat kick in this sequence.